We lost power for a grueling fourteen hours, and this was my main thought: The peaches! The peaches! I never got to make peach crisp this summer and now it’s going to be toooooo laaaaate. I probably should have been worried about 1) How long can Andrew’s tropical fish survive without a heater? or 2) Will my kids be able to attend their first day of school smoothly tomorrow? or 3) Will I have to shower at the YMCA? or 4) How will I feed everyone tomorrow? Or the next day? Or the next day? But Peach Crisp was on my list of things to do this summer, and my peaches weren’t getting any younger. Thankfully Irene spared us, so I was only without an oven for one meal. Peach Crisp, I am sorry I waited until the last minute! After much perusing of recipes and reviews, I settled on this Peach Crisp recipe from Anne Burrell but adapted rather liberally. I doubled the peaches from five to ten, and instead of ramekins (do people really have those? I don’t) I used a 9 x 9 square pan. I omitted raisins, because ewww, raisins. I did not change the sugar content or anything else, and it was still pleasantly sweet, even with twice the peaches. After 35 minutes I started watching it carefully, because it can go from undercooked looking to overly brown in a flash, but it does need a few extra minutes to brown if you use a larger dish. 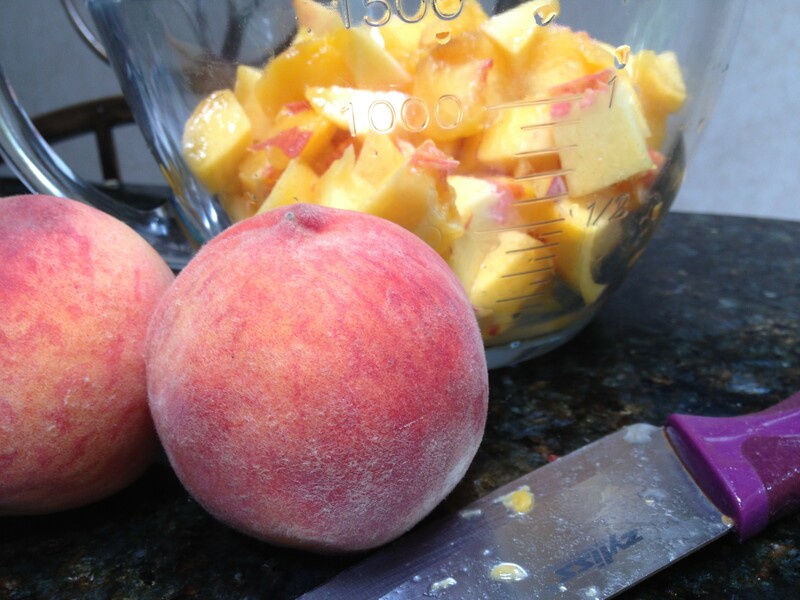 Toss the peaches in a large bowl with the zest and lemon juice. Add the rest of the ingredients and stir to combine. Place peaches in 9 x 9 pan or pie dish. 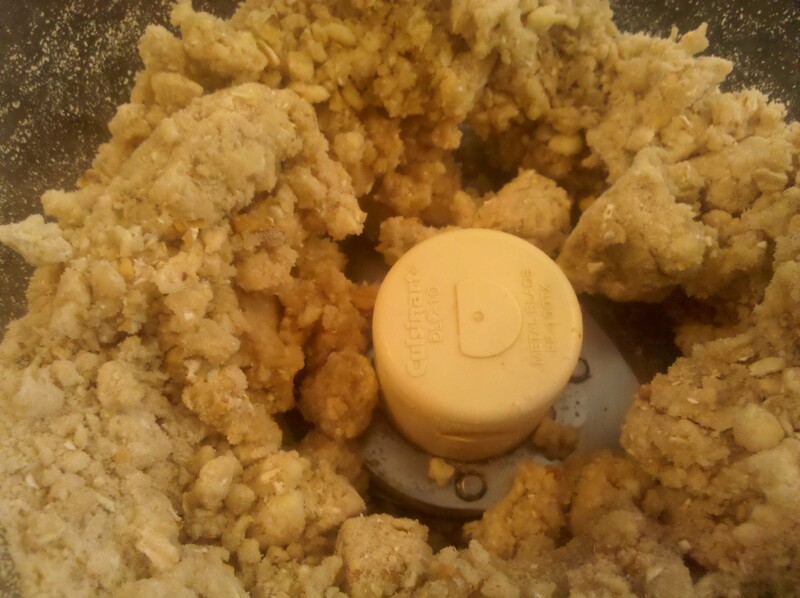 Combine all of the ingredients in a food processor except the water. Pulse until combined, this will take about 30 seconds. Add water, 1 tablespoon at a time until mixture is clumpy but crumbly. Loosely sprinkle the topping and do not pack it down. The idea is to look very crumbly and not neat. What, this old thing? Bake in the preheated oven for 40 minutes, or until the filling is hot and bubbly and the topping, brown and crispy. Note: This is great served hot with vanilla ice cream. 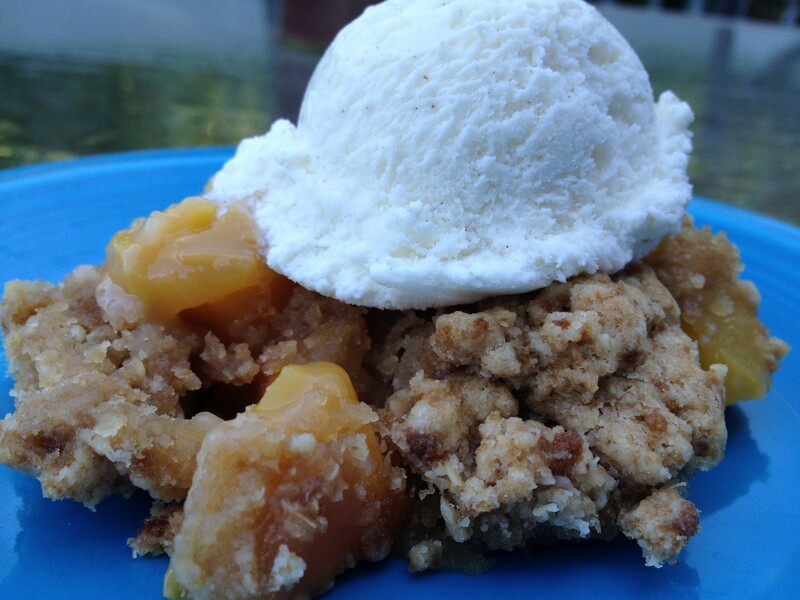 This entry was posted in Desserts and tagged peach crisp by Mom Mom's Apron. Bookmark the permalink. More laps, indeed! I have started swimming, too, and at this rate, I need to swim across the Atlantic.